The Merax Massage Chair is an amazing chair built around updated, older tech that will leave you pleasantly surprised. Recommended for hobbyist and casual users, especially those who love to see old tech kept reasonably up to date. (*) Note: The Brand Reliability metric is a measure of the strength and longevity of the brand, which by extension, is a measure of the level of support you can expect. Are you a vinyl person in the Digital Age, breaking out your old albums and listening to them every chance you get, enjoying the more authentic sound? Or are you the type of person that loves keeping your old Commodore or Amiga computer around to see if you can keep it more-or-less up to date with current technology? If you answered yes to any of those questions, then you’re going to enjoy our detailed Merax Massage Chair review. 1.3 Space-saving and Zero-G Too! By all outward appearances, this should be a terrible massage chair. It’s made from a hodge-podge collection of outdated technology and manufactured by a company whose main claim to fame is making CD and DVD plastic covers. And yet, despite all that, somehow, this chair manages to surprise you. We’ll take a look at everything the Merax has to offer and outline what it can and can’t do in the sections that follow. ​It’s important to remember that this is a value-priced chair, and as such, it’s going to have some pretty severe limitations. Even with those limitations in mind, however, we think you’ll be as pleasantly surprised as we were. Just a moment ago, we said that this model uses outdated tech. Well, here’s the first example of that. Rather than using an S- or Hybrid L/S-Massage Track, it uses a fixed-frame, mounted with semi-stationary massage heads. As it turns out, this is one of the most interesting aspects of the model. In most massage chairs that utilize a fixed-frame, the heads don’t move at all, aside from vibrating in place. That’s not the case here. The heads have some play and can perform a kneading-style massage (inward or outward). Plus, they are specially shaped and give a surprisingly good rendition of a ﻿﻿Shiatsu﻿﻿-style massage. So effectively, you’re getting two techniques: one basic and one advanced. In addition to that, the Merax utilizes a rudimentary body scan which allows the heads to move closer to your back’s pressure points. ​There are some obvious limitations here. The range of movement of the heads is quite restricted. And since the frame is fixed, it does not follow the natural curvature of your body’s spine, so the heads can only move in two dimensions (the X- and Y-Axis). Essentially, this is a first generation “L-Track” where the “L” describes limited movement in two dimensions, rather than the shape of the track, as is the case in chairs that use the modern Hybrid L/S Track system, which describes the shape of the track in general. One final limitation to be aware of here is that the head-based massage only has a single (default) intensity setting. What you get is what you get. 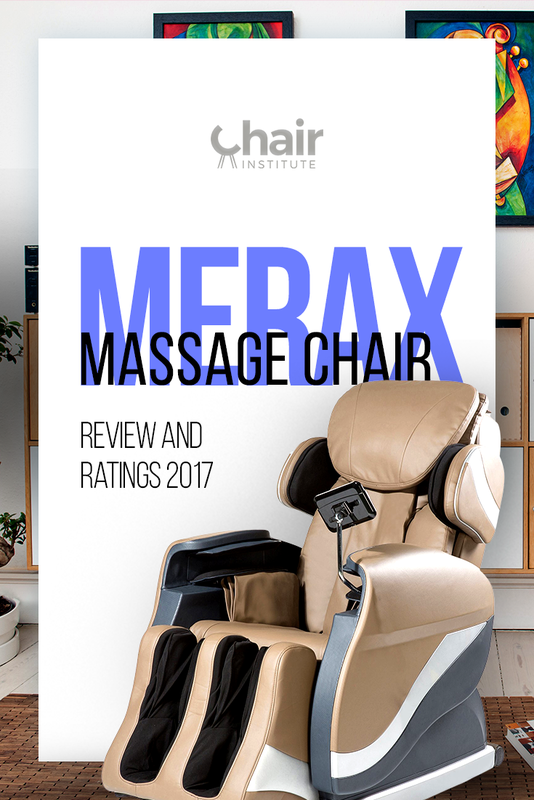 This is another surprise, and our Merax massage chair review would not be complete if we didn’t call particular attention to it. When combined with the back-massage capabilities of the semi-stationary heads, the result is a more robust whole-body massage experience than you might expect. Even better, the Merax offers more in the way of customization here, featuring five different intensity levels. It keeps getting more intriguing. The Merax is designed with space-saving technology, which means you don’t need a lot of clearance between the back of the chair and whatever wall you set it near – five inches should suffice. And it is capable of reclining you to a position such that your knees are elevated slightly above your heart, which leaves you with a feeling of weightlessness while you’re enjoying your massage. From this position, most of your body’s weight is pressing down against the massage heads, resulting in a deeper and more penetrating experience, which is an excellent addition, and a great way to enhance the overall quality of your massage. We've mentioned this earlier, but it deserves its own section because there’s more to say. The calf massage is rendered entirely by airbags, while the foot massage is delivered via a combination of airbags and rollers at the bottom of each foot well. These are also specially shaped to give you a surprisingly good Shiatsu-style foot massage, which is yet another surprise feature. The Merax doesn’t come with a remote but it does have a controller with a small LCD screen and remote-style buttons on it. This is not a touchscreen (yet more old tech) but it gets the job done, is well designed and easy to understand. There’s no significant learning curve here, and you’ll be relaxing in the chair and enjoying your first massage within minutes. Okay, so as you’ve seen from our Merax Chair review, this chair is a true oddity. It utilizes a collection of old tech and manages to make it new again, delivering a much better massage experience than you’d expect. The job Merax has done with this design is nothing short of amazing. It would be like if a couple of high school kids got together to build a race car in their backyard using random parts from their dad’s garage, and that car went on to finish in the top five at the Indy 500. That’s how remarkable this model is. It shouldn’t be any good. It shouldn’t be able to deliver a good massage experience, and we certainly shouldn’t like this chair… but we actually kind of do. Granted, the old tech it uses has its limitations. But if there was one feature we’d love to see that wasn’t included, it’s heat. Having said that, if you’re the kind of person we described in the introduction, then you’re probably already thinking of ways to mod heat to it (heating pad plus extension cord)! Aside from that single omission, we honestly wouldn’t change a thing. The moment you start updating the tech, you destroy the entire design philosophy of the chair. The Merax isn’t going to appeal to everyone, but we were impressed at not only the overall quality of the design but how far the manufacturer was able to stretch the limits of the old tech the chair is built around. ​It provides tremendous value for the money and is one of the best values for the money we’ve ever seen. Highly recommended for casual and hobbyist users. Merax Massage Chairs, Official Brand Website. Merax Massage Chair Product Manual. Massage Therapy for Neck and Shoulder Pain: A Systematic Review and Meta-Analysis, NCBI. Relaxation Massage, The Good Spa Guide. 16 Benefits of Shiatsu Massage, Feel Pain Relief.